Winter is officially here. THANK YOU! I was going crazy from the lack of snow. I couldn’t trail run, too much mud/snow but not enough snow to ski. MY FEET HURT…ALWAYS. I feel like I have a battle every time I ski, my feet! Yes, arthritis in my feet. I know, quit skiing, running etc but I can’t. It’s what makes me tick. 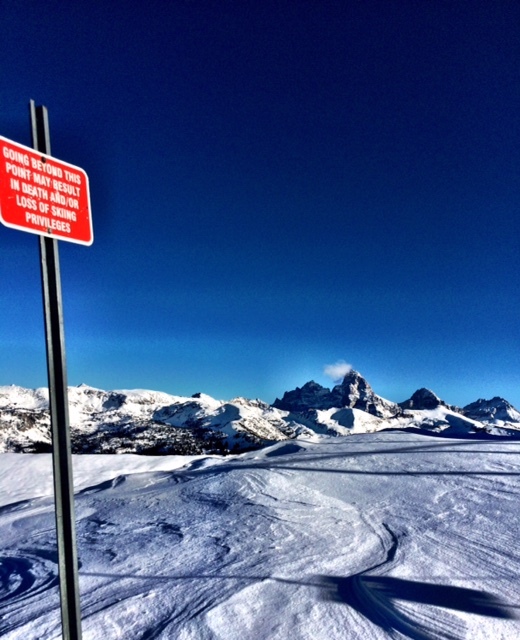 Yesterday at Targhee it was serious braille skiing. My brother and I skied down Crazy Horse avoiding the football field (flat) to get to the chutes. I couldn’t tell if I was skiing down, sideways or up but the goods we found were well worth it! Oh my gosh…heaven! Ten glorious untracked deep & steep powder turns. And that’s why I deal with my feet. Such a great day. Why I love to ski, Bonding. I bond with people. Connect with others that I never would in any other circumstance. It’s amazing. Whether it’s skiing High Boy with a new ‘cute friend’ you just met on the chairlift or with your dad or brother, skiing powder up to your chest while choking on snow. We connect. Not all people can connect, but those who can it’s magical. Skiing has brought me a lot in my life. 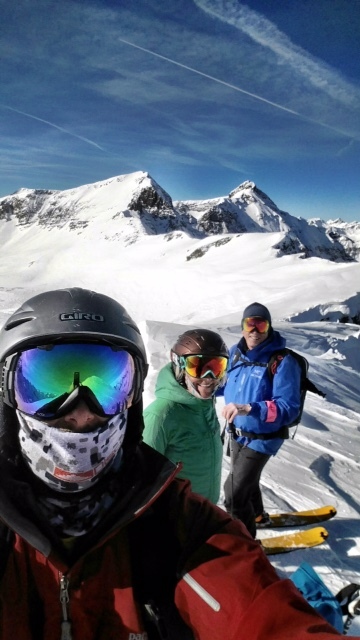 I’ve met amazing, unique people through skiing. I’ve cried, laughed as I wiped that silly grin off my face, and connected with strangers and those close to me while skiing. It’s my happy place. And I’m never going to give it up. Some may say I’m crazy, not normal, and obsessed but I’m happy. Really happy. I’m grateful it’s something I can do with my family, my nieces and nephews, strangers, friends and those dear to me. I’m grateful for the passion I have for the outdoors and skiing. I wouldn’t change anything. So thank you mom and dad for all those Saturday’s, I mean EVERY single Saturday from 2 until I moved out the house that we spent on the ski hill. There’s a bond that can never be broken and that bond melts all my other worries away when I’m on the mountain. It’s a great day to be skiing! To my family of ski bums, Lenox (2) to Natalia (19) to mom (dying of cancer but still skis) to my dad (66, skis more than me) and Jess (skis her heart out when she’s in the west even if it kills her) and Mike (will always be a better skier than me and I ski A LOT more days) and Jill with her whit and natural talent (I have to work really hard at it). 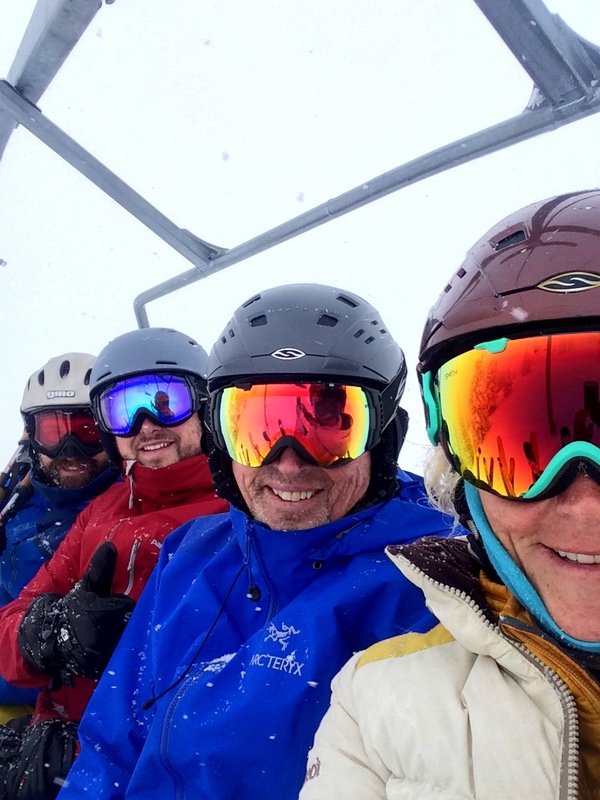 I LOVE my family who skis because that’s just what us HUSKINSON’S do, we ski and have fun while we’re doing it! I can’t believe it’s November 18th and there’s little snow! I’m going through withdrawals and I know I’m not alone. Skiers, we’re a different breed. We live, sleep, eat, drink, sacrifice, loose jobs, relationships and everything else in our life so we can ski. To say we LOVE it, is an understatement. I know most people don’t understand me and my lifestyle but I don’t expect them to. I’ve always NOT been the norm. But I’m happy. I’m surrounded by amazing people who appreciate a sunrise, a sunset, an amazing powder day, hiking through the Alps on skis, seeing pure joy on someones face at the bottom of a run they skied for the first time, they enjoy the simple things nature has to offer. And for us, that’s good enough. 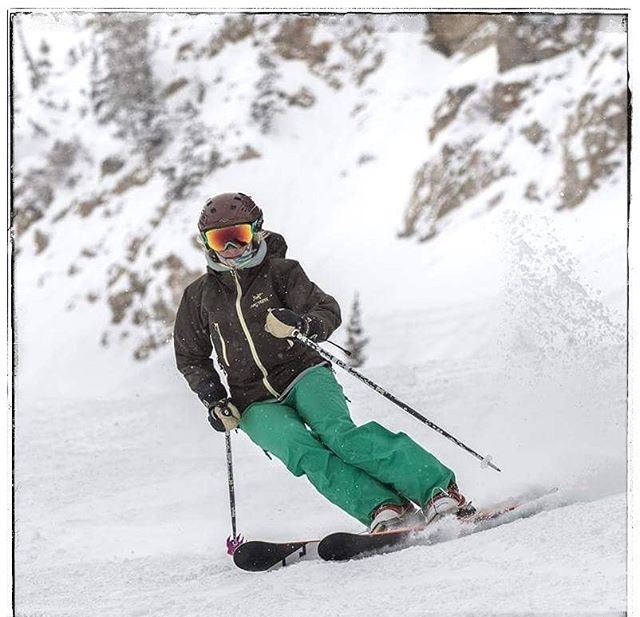 We don’t have fancy houses and sometimes we don’t wear the latest fashion but we have priorities; the best skis, coat, goggles, trips to find the perfect turns through bottom-less powder or skiing the couloir you’ve had your eye on for years. That’s what we do. No, we are not normal but we are happy! Mom and Dad, the best thing you ever gave me was the skill to ski, enjoy nature and appreciate nature and enjoy a sport that has given back to me more than I will ever have to offer. 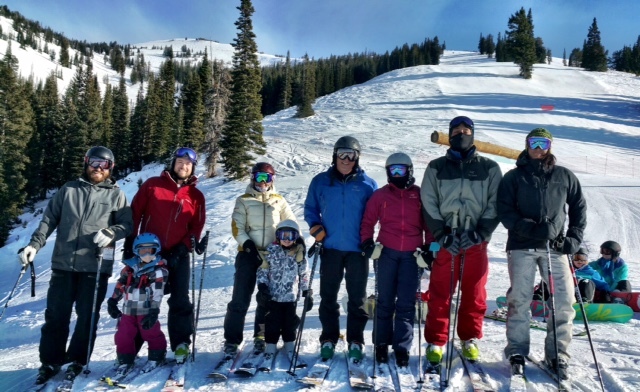 My family still skis together, grandma, grandpa, sisters, brothers, in-laws and grandkids. We all LOVE to ski! Even my little adventure buddy loves the snow. Find your passion. Find your happy place. Life is too short. I dare you! You may never come back… but I promise you’ll be happy. Crazy it’s October 12th and I’ve already skied three days! After the St George marathon, I posted “Done with running and now I’m ready for winter and skiing!” I had no idea I’d be skiing great powder three days later. It was fun and as we were hiking up it was cold, snowing and windy. I would have thought it was the middle of winter, not the first of October. Teton had fun one day with me but looked was covered with snowballs. 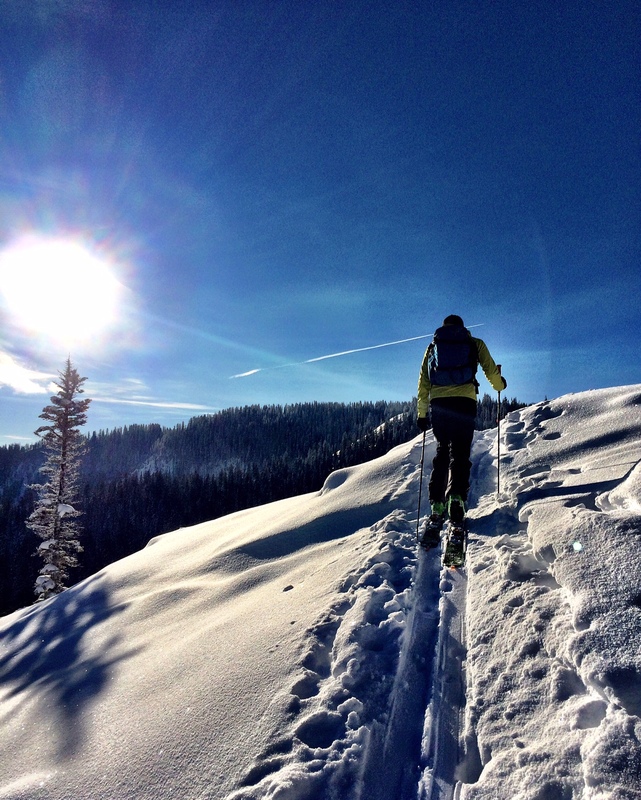 A recent article was written about the influence of social media and backcountry skiing and the decisions people are making. You can read it HERE. I found it interesting in the US 27 people die in avalanches a year. At a conference last weekend, attendees not only heard from physicists but neurologists, behavior scientists, and psychologists. More focus during backcountry ski training, they say, needs to go towards decision making. It is a skill that needs to be taught. Some food for thought as we enter the ski season. The tides are changing into spring and the snow is dwindling fast. I always have mixed emotions this time of year. Although I’m happy to see the sunshine, I have to say good-bye to my dear friend, snow. All that fluffy stuff creates so much joy and happiness for six months a year and brings me together with my mountain community. It’s sad to say good-bye to those friends I see in the mountains doing what we love, ski. But change is good and forward I must go. Until we meet again old man winter! Time flies when the snow starts to fly! Ski season is underway and so are the burning calves, feet that hurt, the never ending boot adjusting and thighs getting into shape. But, all that pain disappears on a blower powder day. 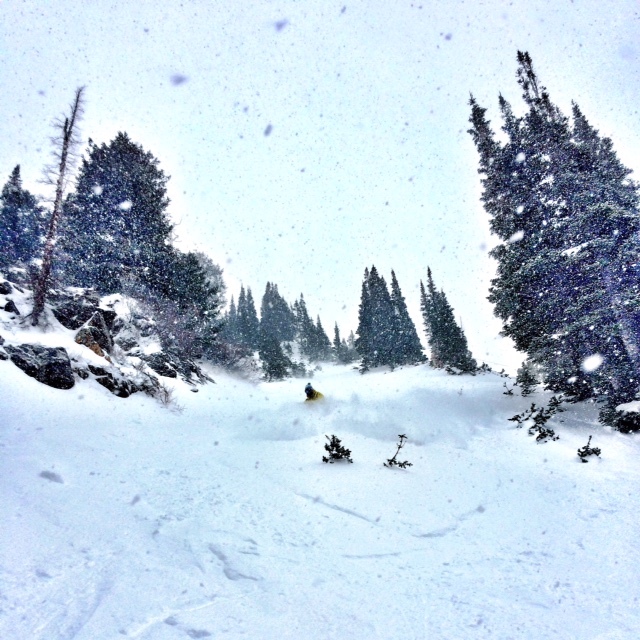 Yesterday was THE best powder day at Alta, Utah. We’ve had a rough few years and all though the skiing has been fun, there’s nothing like a deep waist and chest deep blower powder day. Everyone was all smiles, happy old man winter decided to finally visit. All the hurt and agony of getting into ski shape paid off yesterday and I’m sure there’s more to come. Winter is here! Last night I went for a night tour. Long day at work, too late to drive home to Idaho to be with the family. I needed an outing. As I started hiking in the dusk that would turn to dark I looked around and knew this was my happy place. It was cold, snowing and a blustery night but I couldn’t think of any other place I’d rather be. 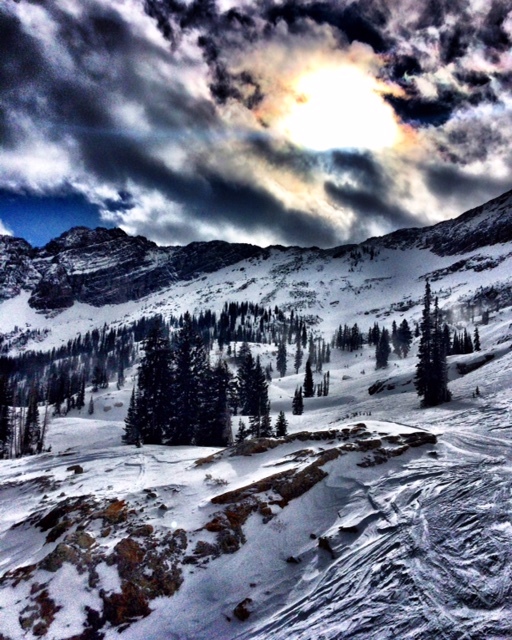 The down was fun, just the beginner run at Alta but the solitude experienced was well worth the trek. Hiking through the blizzard I contemplated the things I was grateful for: my dad who introduced me to skiing, adventures and the outdoors. My mom, for teaching us to live life to the fullest and to laugh along the way. My siblings, for pushing me to become the person I am today. The amazing people that have come into my life and stayed and others who are gone but made an impact on my life. Friday Five: My top picks for ski gear and they are all on sale! The lifts are starting to turn today for several ski areas. I’ll be heading up to Alta Ski Area to get my first day turns in for opening day today. I’m excited ski season is back and I can’t wait to test out my new gear! Check out these deals on soft goods to get you ready for the slopes! See you out there! 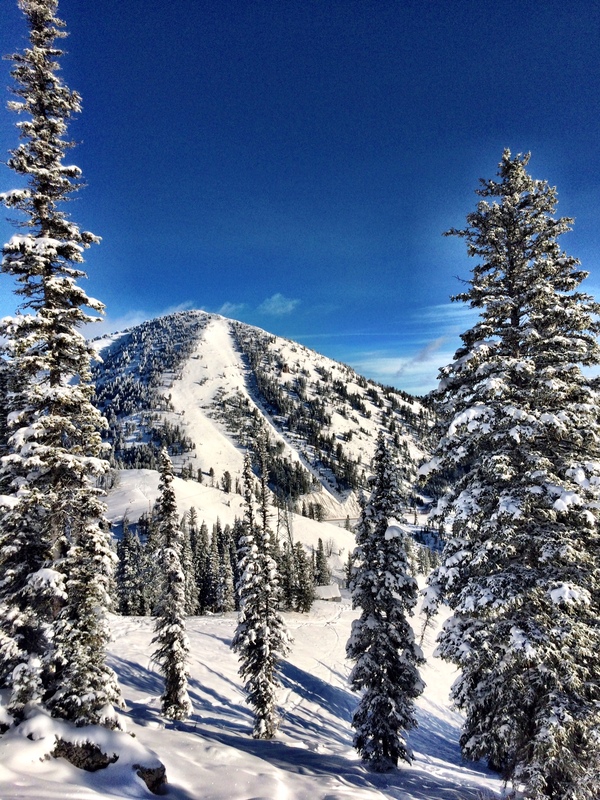 #mountaincrushmonday…The mountains are covered in white goodness and calling me to them. If I don’t answer…I’m hanging with my crush, all the time, everyday, his name: the mountains, my true love. Winter is upon us and we’ve been getting out in that fun white stuff called snow. I LOVE snow and winter is my favorite season. My little buddy Teton loves it too. I found the perfect dog for me. 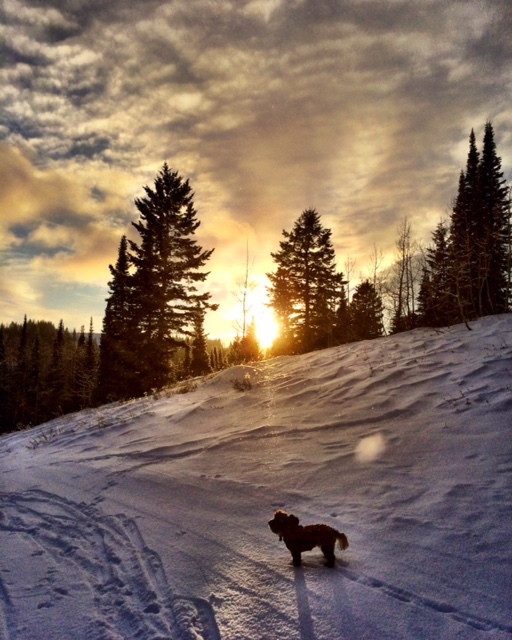 This weekend we went out and played in the snow and Teton had his first backcountry experience. I’m sure when we rolled up and started skinning everyone was thinking, ‘Who brought the princess dog in bright yellow boots and a plaid vest.’ That would be me. I know my little Teton and he beat me to the top of the mountain. He loved every minute of it and the skiing experience on the way down was new but fun for little Teton. He may be little but he’s tough as nails. Teton has ‘hair’ so snowballs form on him the longer we play in the snow. So a plaid puffy vest helps keep the snow off and he’s my dog, he has to have a puffy too! I put little booties on his feet to help with the cold snow but mainly to keep his feet dry when he’s prancing on my lap as we’re driving home. Yes, I have a small or toy dog but the only time he’ll sit on my lap or take a nap in my lap is in the car. So booties it is to keep me dry, dirt free and to keep my car clean. Check out Teton’s attire. It works and it’s on sale. Puffy vest, booties, water bowl and Teton’s favorite treats ! There are lots of great deals out there for last year’s models. Same great product, just a new graphic or color change for this years models. Check out A’s top picks! K2 Missbehaved. A great all-mountain women’s ski that will float in the powder but still hold an edge on the groomers. 102 underfoot. The Patagonia Nano puff vest has been my favorite find from a few years back. I now own three. On those extra chilly days I’ll wear this under my shell on top of my normal layers or when I’m in the backcountry throw it over my top layer as I’m pulling skins or skiing down. 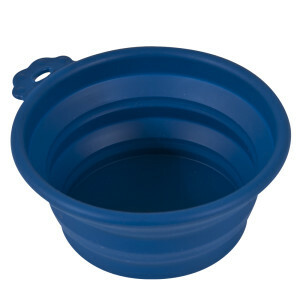 Everyone needs one of these in their layering line-up. We all have to haul our gear up to the mountains and it’s best to keep everything organized and in a designated ‘ski bag’. This Marmot Long Hauler Duffel Bag is a great deal and perfect size for all your goggles, ski socks, beanies, helmet, buffs, sunscreen, hand warmers and everything else. Just don’t forget to dry your gear out when you get home. Come March this bag will be really ripe if you don’t!